The Peerless Blowers Synergy Series – Direct Drive Plenum Fan combines American made engineering with the latest in European impeller diffuser technology to create the most efficient plenum fan on the market. The Synergy Plenum Fans achieve the highest levels of efficiency that result in higher power density and lower noise transmission. 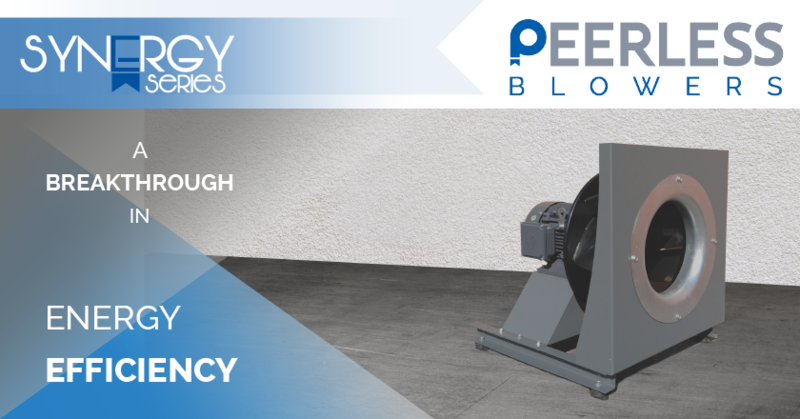 Equipped with NEMA Premium or Permanent Magnet motors, Synergy Series – Direct Drive Plenum Fan in combination with a frequency converter offers the maximum in controllability, efficiency, and reliability. Standardly equipped with a pressure tapped inlet cone, allowing for easy integration with differential pressure measuring devices, for regulation control of air flow performance and blower efficiency. With sizes ranging from 400mm (15.75″) to 560mm (22.1″), and motor options ranging from 5HP to 20HP, the Synergy Series Plenum Fan can operate over 15,300 CFM and over 11.6″ of static pressure. These blowers will be ideal for HVAC units, air handling units (AHU), data centers, heat recovery systems, and many other custom solutions.